11th lunar month of 1759: he makes his first appearance on stage at the Nakamuraza, receiving the name of Sawamura Tanosuke I. 11th lunar month of 1769: Tanosuke and his father go to Kamigata. They perform together in Kyôto in the drama "Asahimaru Genji Kagami", which is produced by Onoe Kumesuke and celebrates the shûmei of Nakamura Shingorô II. 8th lunar month of 1770: his father Sawamura Sôjûrô II dies in Kyôto. The actor Arashi Sangorô II welcomes Tanosuke into his home. 3rd ~ 5th lunar months of 1771: first Kabuki adaptation of the puppet theater drama "Imoseyama Onna Teikin", produced by Mimasu Tokujirô I at the Kitagawa no Shibai; Tanosuke plays the role of Koganosuke [casting]; his partner in the role of Hinadori is Sawamura Kunitarô I. 11th lunar month of 1771: Sawamura Tanosuke I takes in Kyôto at the Kitagawa no Shibai the name of Sawamura Sôjûrô III, playing the role of Nitta Yoshisuke in the kaomise drama "Miyako Yoshino Mikado no Takadono", which is produced by Mimasu Tokujirô I, welcomes in Kyôto the Edo actor Sakata Hangorô II and celebrates also the shûmei of both Anegawa Minato II and Yamatoyama Rinzaemon II; Sôjûrô's others stage partners are Onoe Shinshichi I, Sawamura Kunitarô I, Ichikawa Tomozô I, Arashi Tôjûrô, Arashi Shichigorô II, Bandô Manzô, Yamashita Shungorô and Fujikawa Sango. 1st lunar month of 1772: Sôjûrô plays the role of Momonoi Wakasanosuke in the drama "Kanadehon Chûshingura", which is staged in the same theater. 11th lunar month of 1772: Sôjûrô plays at the Kitagawa no Shibai 2 roles in the kaomise drama "Shiraume Genji Kuruwa no Hachinoki", which is produced by Anegawa Chiyosaburô II. 1st lunar month of 1773: Sôjûrô plays in the same theater the roles of Yamazaki Yogorô and Imagawa Tokiwanosuke in the drama "Koi Denju Chôchô Narezome Zakura", whose plot and characters belong to the "Futatsu Chôchô Kuruwa Nikki" world. 2nd lunar month of 1773: Sôjûrô plays in the same theater the roles of En'ya Hangan and Konami in the drama "Kanadehon Chûshingura". 5th lunar month of 1773: Sôjûrô plays in the same theater the role of Yamazaki Yogorô in the drama "Futatsu Chôchô Kuruwa Nikki". 11th lunar month of 1773: Sôjûrô moves to Hayagumo Chôdayû and Hoteiya Umenojô theater, playing in the kaomise drama "Etariya Etari Tsuwamono Majiwari", which is produced by Yoshizawa Iroha I. 1st lunar month of 1774: Sôjûrô plays the roles of Hosokawa Iorinosuke and the peasant Yoshirô in the drama "Keisei Miyako no Nishiki", which is performed in the same theater. 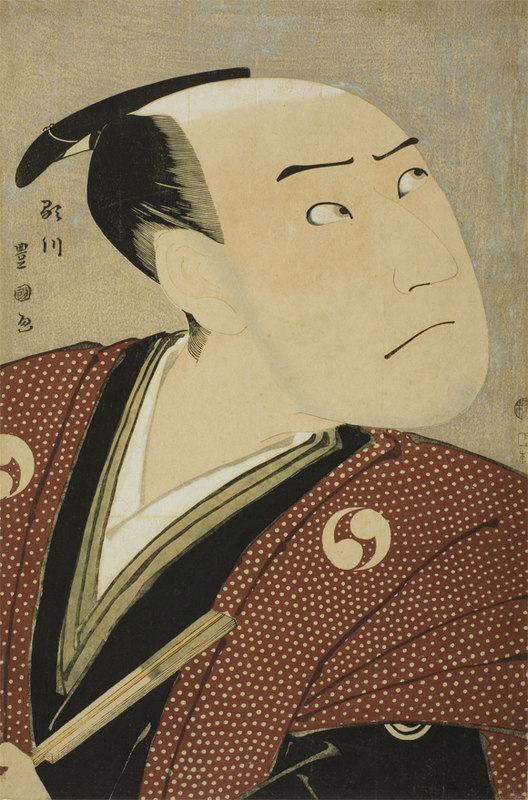 Fall 1774: Sôjûrô plays in the same theater the role of Abe no Yasuna in the drama "Ashiya Dôman Ôuchi Kagami". 11th lunar month of 1774: Sôjûrô plays in the kaomise program "Akanesasu Kogane no Maruyama", which is produced by Fujikawa Sango in the same theater. 2nd lunar month of 1775: Sôjûrô plays the role of Kiriko Senjirô in the drama "Keisei Kane no Nariwataru", which is staged in the same theater. 3rd lunar month of 1775: Sôjûrô plays in the same theater the role of Yamazaki Yogorô in "Futatsu Chôchô Kuruwa Nikki". 11th lunar month of 1775: Sôjûrô settles in Ôsaka and plays in the drama "Gohiiki Tenmokuzan", which is produced by Mimasu Matsunojô at the Naka no Shibai. 12th lunar month of 1775: Sôjûrô plays in the same theater the role of En'ya Hangan in the drama "Kanadehon Chûshingura". 7th lunar month of 1776: Sôjûrô plays the roles of Yoshitsune and Tadanori in the drama "Ichi-no-Tani Futaba Gunki", which is staged in the same theater. 8th lunar month of 1776: Sôjûrô plays in the same theater the roles of Yosaku and Keimasa in "Koi Nyôbô Somewake Tazuna". 11th lunar month of 1776: Sôjûrô plays in the kaomise program "Genji Saikô Uchide no Kozuchi", which is produced by Arashi Shichisaburô II in the same theater. 12th lunar month of 1776: premiere at the Naka no Shibai of Nagawa Kamesuke I's drama "Igagoe Norikake Gappa"; Sôjûrô plays the role of Wada Shizuma [casting]. 4th lunar month of 1777: premiere in Ôsaka at the Naka no Shibai of Nagawa Kamesuke I's drama "Meiboku Sendai Hagi"; Sôjûrô plays the role of Nagoya Jûzô [casting]. 11th lunar month of 1777: after nine years spent in Kamigata, Sôjûrô decides to return to Edo. He plays at the Moritaza in the kaomise drama "Hito no Kuni Yori Mitsugi no Irifune". 1st lunar month of 1778: the play "Imoseyama Onna Teikin" is performed for the very first time in Edo, at the Moritaza. Sôjûrô plays the roles of Shibaroku, Motome and Koganosuke. 7th lunar month of 1778: Sôjûrô plays in the same theater the role of Yamazaki Yogorô in the drama "Futatsu Chôchô Kuruwa Nikki". 5th lunar month of 1780: tour in Sendai. 11th lunar month of 1780: Sôjûrô plays at the Nakamuraza the roles of Taira no Munemori, Higuchi Jirô Kanemitsu and Kongô Dôji in the kaomise program "Kite Kaeru Nishiki no Wakayaka". 1st ~ 3rd lunar months of 1781: the Nakamuraza has to delay his new year program because of several financial issues. 5th lunar month of 1781: Sôjûrô plays in the same theater the role of Hisamatsu in the drama "Shôbu Zake Muko no Otogi". 11th lunar month of 1781: premiere of the dance-drama "Waga Sekogakoi no Aizuchi" (commonly called "Kumo no Hyôshimai") at the Nakamuraza, which is performed within the kaomise program "Shitennô Tonoi no Kisewata"; the roles of the spirit of the spider, Minamoto no Raikô, Sadamitsu and Sakata Kintoki are played by Segawa Kikunojô III, Sôjûrô, Onoe Matsusuke I and Ichikawa Danjûrô V.
1st lunar month of 1782: Sôjûrô plays in the same theater the role of Soga Jûrô Sukenari in the new year program "Nanakusa Yosooi Soga"; the roles of Soga Gorô Tokimune and Kudô Saemon Suketsune are played by Ichikawa Monnosuke II and Ichikawa Danjûrô V.
5th lunar month of 1782: Sôjûrô plays in the same theater the role of the shirozake seller Shinbê in the drama "Sukeroku Kuruwa no Natori Gusa"; the roles of Sukeroku, Agemaki and Ikyû are played by Ichikawa Danjûrô V, Nakamura Rikô I and Nakamura Nakazô I. 7th lunar month of 1782: Sôjûrô plays in the same theater the roles of Ashikaga Yorikane and Hosokawa Katsumoto in the drama "Datezome Shikata Kôshaku", whose plot and characters belong to the "Meiboku Sendai Hagi" world. 11th lunar month of 1782: Sôjûrô plays at the Nakamuraza the roles of Hachiman Tarô, Manzai and Katsuta Jirô in the kaomise drama "Godai Genji Mitsugi no Furisode"; his stage partners are Ichikawa Danjûrô V, Iwai Hanshirô IV, Segawa Kikunojô III, Ichikawa Danzô IV and Onoe Matsusuke I. 1st lunar month of 1783: Sôjûrô plays in the same theater the roles of the priest Seigen and Soga Jûrô Sukenari in the new year drama "Edo no Hana Mimasu Soga"; the roles of Princess Sakura and Soga Gorô Tokimune are played by Iwai Hanshirô IV and Ichikawa Monnosuke II. 5th lunar month of 1783: Sôjûrô plays in the same theater the role of Hayano Kanpei in the drama "Kanadehon Chûshingura". His stage partner in the role of Kanpei's wife Okaru is Segawa Kikunojô III. 8th lunar month of 1783: Sôjûrô plays in the same theater the role of Nuregami Chôgorô in the drama "Futatsu Chôchô Kuruwa Nikki". His stage partner in the role of the rival sumô wrestler Hanaregoma Chôkichi is Ichikawa Monnosuke II. 11th lunar month of 1783: Sôjûrô moves to the Ichimuraza and plays 4 roles in the kaomise drama "Kuruma Gakari Tekuda no Gunbai". 4th lunar month of 1784: Sôjûrô and Nakamura Nakazô I quarrel. 5th lunar month of 1784: the Ichimuraza moves from its current location to the district of Kobiki-chô. Sôjûrô goes back to the Nakamuraza. 7th lunar month of 1784: Sôjûrô plays the roles of Tadanobu and the fox Genkurô in the drama "Yoshitsune Senbon Zakura", which is staged at the Nakamuraza. Sôjûrô replaces Ichikawa Monnosuke II who was supposed to play these roles but left suddenly the theater in the 6th lunar month. 8th lunar month of 1784: Sôjûrô plays in the same theater the role of Kamiya Jihê in Chikamatsu Monzaemon masterpiece's "Shinjû Ten no Amijima". The role of Koharu is played by Iwai Hanshirô IV [print]. From the 17th of this month, he plays the role of Ôboshi Yuranosuke in the drama "Kanadehon Chûshingura". 9th lunar month of 1784: Sôjûrô plays in the same theater the role of Abe no Yasuna in the drama "Ashiya Dôman Ôuchi Kagami", which celebrates the departure of Iwai Hanshirô IV to Ôsaka. 11th lunar month of 1784: Sôjûrô performs in the same theater in the kaomise program "Ôakinai Hiru-ga-Kojima". 1st lunar month of 1785: Sôjûrô plays in the same theater the roles of Kudô Saemon and Soga Jûrô in the new year drama "Hatsuhana Mimasu Soga". He also plays the role of Jûrô in the Tomimoto-based dance-drama "Shinobu Koi Yanagi ni Katsurao". 3rd lunar months of 1785: the great actor Ichimura Uzaemon IX appears on stage for the last time, at the Nakamuraza, performing in the drama "Mitsu Ningyô Yayoi no Hinagata" in the company of Sôjûrô. 8th lunar month of 1785: Sôjûrô plays in the same theater the role of Takebe Genzô in the drama "Sugawara Denju Tenarai Kagami". 9th lunar month of 1785: Sôjûrô plays in the same theater the role of Takeda Katsuyori in the drama "Osana Najimi Kasane Kotoba". 5th lunar month of 1786: Sôjûrô plays in the same theater the roles of En'ya Hangan and Kakogawa Honzô in the drama "Kanadehon Chûshingura". His stage partner in the role of Yuranosuke is his brother Ichikawa Yaozô III. 6th lunar month of 1786: Sôjûrô plays in the same theater the role of Issun Tokubê in the drama "Natsu Matsuri Naniwa Kagami". His stage partners in the roles of Danshichi Kurobê and Tsuribune Sabu are Ôtani Hiroji III and Nakayama Kojûrô VI. 11th lunar month of 1786: Sôjûrô takes part in the Nakamuraza kaomise program called "Kumoi no Hana Yoshino no Wakamusha". He plays among others the role of the warrior Kusunoki no Masatsura in "Sodefuru Yuki Yoshino Shûi". 3rd lunar month of 1787: Sôjûrô plays in the same theater the role of Soga Jûrô, disguised as a sake-seller, in the play "Sukeroku Natori no Yaezakura". His stage partners in the roles of Sukeroku/Soga Gorô, Agemaki and Ikyû are Ichikawa Yaozô III, Osagawa Tsuneyo II and Onoe Matsusuke I. 5th lunar month of 1787: Sôjûrô plays in the same theater the roles of Momonoi Wakasanosuke, Teraoka Heiemon and Amakawaya Gihei in the drama "Kanadehon Chûshingura". 9th lunar month of 1788: Sôjûrô plays in the same theater the role of Kawaraya Tokubê in the drama "Tsuki no Tomo Yoi no Miya Gohyakuzaki". 1st lunar month of 1789: Sôjûrô moves to the Ichimuraza, which was back in business in the 11th lunar month of 1788, playing the role of Danzaburô, Soga Jûrô Sukenari and Noriyori in the new year program "Koi no Yosuga Kanagaki Soga". His stage partners are Ichikawa Danjûrô V, Segawa Kikunojô III, Iwai Hanshirô IV, Asao Tamejûrô I and Onoe Matsusuke I. 3rd lunar month of 1789: Sôjûrô plays in the same theater the role of Hikoroku in the second part (nibanme) of the new year program "Koi no Yosuga Kanagaki Soga". He also performs in duo with Segawa Kikunojô III in the Tomimoto-based dance "Sono Omokage Asama-ga-Dake". 4th lunar month of 1789: Sôjûrô plays in the same theater the role of Kameya Chûbê in Chikamatsu Monzaemon's drama "Koi Bikyaku Yamato Ôrai". His stage partner in the role of the courtesan Umegawa is Segawa Kikunojô III. 5th lunar month of 1789: Sôjûrô plays in the same theater the roles of Shindô Genpachi and Kashima Masugorô in the drama "Sanjukkoku Yobune no Hajimari". 6th lunar month of 1789: Sôjûrô plays in the same theater the roles of En'ya Hangan, Hayano Kanpei, Jûtarô and Ishidô Nuinosuke in the drama "Taiheiki Chûshin Kôshaku". 11th lunar month of 1789: Sôjûrô performs in the Ichimuraza kaomise program "Hana no Oedo Masakado Matsuri". 1st lunar month of 1790: his rank in the Edo hyôbanki, tachiyaku section, is shi-jô-jô-kichi (unique - superior - superior - excellent). Sôjûrô plays in the same theater the roles of Kyô no Jirô and Kudô Saemon Suketsune in the new year drama "Ureshiku Zonji Soga". 3rd lunar month of 1790: Sôjûrô, Ichikawa Danjûrô V, Iwai Hanshirô IV and Ôtani Hiroji III perform together in the Tokiwazu-based dance-drama "Tao Yanagi Oboro no Kurokami". 4th lunar month of 1790: Sôjûrô plays in the same theater the role of Hanbei in the love drama "Ochiyo Hanbei". His partner in the role of Ochiyo is Iwai Hanshirô IV. 6th lunar month of 1790: Sôjûrô plays in the same theater the role of Sagisaka Sanai in the drama "Koi Nyôbô Somewake Tazuna". 8th lunar month of 1790: Sôjûrô plays the roles of Ôboshi Yuranosuke and Hayano Kanpei in the drama "Kanadehon Chûshingura", which is performed in the same theater. 9th lunar month of 1790: the play "Yoshitsune Koshigoejô" is staged for the first time in Edo, at the Ichimuraza; it celebrates the onagori kyôgen of the Kamigata star Asao Tamejûrô I; Sôjûrô plays the role of Izumi no Saburô [more details]. 1st lunar month of 1791: Sôjûrô plays in the same theater the roles of Soga Jûrô Sukenari, Mankô and Miura Yoshimura in the new year drama "Shunshoku Edoe Soga", which celebrates the arrival in Edo of the Kamigata actor Sawamura Kunitarô I. 6th lunar month of 1791: Sôjûrô plays in the same theater the roles of Tadanobu, Yasuke (the "Sushiya" scene) and the fox Genkurô in the drama "Yoshitsune Senbon Zakura". 9th lunar month of 1791: Sôjûrô plays in the same theater in the drama "Take no Haru Yoshiwara Suzume", which celebrates his coming departure to Ôsaka. 11th lunar month of 1791: second stay in Kamigata; Sôjûrô plays in the kaomise drama "Furisode Shuten Dôji", which is produced by Hanagiri Tomimatsu II in Ôsaka at the Naka no Shibai. He also plays the role of Ôboshi Yuranosuke in the drama "Kanadehon Chûshingura". 1st lunar month of 1793: Sôjûrô is back in Edo and plays the role of Soga Jûrô in the drama "Saikai Soga Nakamura", which is staged at the Nakamuraza. 4th lunar month of 1793: Sôjûrô plays in the same theater the roles of Amakawaya Gihei and Yuranosuke in the drama "Kanagaki Azuma Kagami", whose plot and characters belong to the "Kanadehon Chûshingura" world. The performance is a great success for Sôjûrô. Fall 1793: Sôjûrô plays in the same theater the roles of Yamazaki Yogorô and Nuregami Chôgorô in "Futatsu Chôchô Kuruwa Nikki". 11th lunar month of 1793: third stay in Kamigata. Sôjûrô plays in Namiki Gohei I's drama "Kogane Masu Yonetarô Gitsune", which is produced in Ôsaka at the Naka no Shibai by Nakayama Yosaburô II and celebrates the shûmei of Nakayama Bunshichi II; others actors are Kataoka Nizaemon VII, Sawamura Kunitarô I and Arashi Sangorô II. 12th lunar month of 1793: Sôjûrô plays the role of Kitabatake Kazue-no-Kami in the drama "Keisei Yamato Zôshi", which is staged in the same theater. 2nd lunar month of 1794: Sôjûrô is back in Edo and plays the role of Soga Jûrô in the drama "Hatsu Akebono Kaomise Soga", which is staged at the Miyakoza. 9th lunar month of 1794: Sôjûrô plays in the same theater the role of Yoshitsune in the drama "Yoshitsune Senbon Zakura". 10th lunar month of 1794: due to some financial difficulties, the salaries of all the actors are drastically reduced. Sôjûrô's yearly salary for the coming season is set to 800 ryô after a reduction of 300 ryô. 11th lunar month of 1794: Sôjûrô plays at the Miyakoza the roles of Ôtomo no Kuronushi and Kujaku Saburô in Namiki Gohei I's kaomise drama "Uruô Tosshi Meika no Homare", which celebrates the shûmei of Nakamura Nakazô II and welcomes in Edo the actors Kataoka Nizaemon VII and Nakamura Noshio II and the Ôsaka playwright Namiki Gohei I. 1st lunar month of 1795: Namiki Gohei I's drama "Godairiki Koi no Fûjime" is staged for the first time in Edo, at the Miyakoza; Sôjûrô plays the role of Satsuma Gengobê [casting]. 4th lunar month of 1795: Sôjûrô plays in the same theater the roles of En'ya Hangan and Kakogawa Honzô in the drama "Kanadehon Chûshingura". 8th lunar month of 1795: Sôjûrô plays in the same theater the roles of the warrior Kumagai Jirô Naozane and Rokuyata in the drama "Ichi-no-Tani Futaba Gunki". His stage partner in the role of Kumagai's wife Sagami is Segawa Kikunojô III. 9th lunar month of 1795: Sôjûrô plays in the same theater the role of Abe no Yasuna in the drama "Ashiya Dôman Ôuchi Kagami". 11th lunar month of 1795: Sôjûrô moves to the Kiriza and takes part in the kaomise program "Genpei Hashira Goyomi". This performance is also the shûmei of Ôtani Tomoemon II. 1st lunar month of 1796: Sôjûrô plays in the same theater the role of Soga Jûrô Sukenari in the new year program "Soga Daifukuchô". He also plays the role of Ume no Yoshibê in the premiere of Namiki Gohei I's drama "Suda no Haru Geisha Katagi" [casting]. His performance is so great that the role of Ume no Yoshibê is definitively set based on Sôjûrô's acting in this play. This role will also become a standard to portray an Edo otokodate. 4th lunar month of 1796: Sôjûrô plays in the same theater the roles of Yuranosuke and Fuwa in Namiki Gohei I's drama "Edo no Hana Akô no Shiogama", whose plot and characters are similar to "Kanadehon Chûshingura". 9th lunar month of 1796: the play "Hikosan Gongen Chikai no Sukedachi" is staged for the first time in Edo, simultaneously at the Kiriza and the Miyakoza; Sôjûrô plays the roles of Rokusuke and Lord Koori Otonari in the former theater [casting]. 11th lunar month of 1796: Sôjûrô plays 3 roles in the Kiriza kaomise drama "Ginsekai Matsu ni Yukihira". 1st lunar month of 1797: Sôjûrô plays in the same theater 3 roles, including Soga Jûrô Sukenari, in the new year program "Ôkazari Soga no Kadomatsu"; the roles of Soga Gorô Tokimune and Kudô Saemon Suketsune are played by Ichikawa Omezô I and Bandô Hikosaburô III. 5th lunar month of 1797: Sôjûrô plays in the same theater the role of Karigane Bunshichi in Namiki Gohei's drama "Aigikyô Karigane Komon", a revival of "Aigikyô Karigane Gomon", written by the same playwright and staged for the first time in Ôsaka at the Kado no Shibai in the 7th lunar month of 1774. Sôjûrô's stage partners are Segawa Kikunojô III (Bunshichi's wife Otsuta, Heibei's wife Otsugi), Arashi Ryûzô II (Kaminari Shôkurô), Ichikawa Omezô I (Hotei Ichiemon), Ôtani Hiroji III (Yamakawaya Gon'emon), Ôtani Tomoemon II (Gokuin Sen'emon) and Nakamura Denkurô IV (Yamakawaya Gonroku). 9th lunar month of 1797: Sôjûrô plays in the same theater the role of Matsuômaru in the drama "Sugawara Denju Tenarai Kagami". 11th lunar month of 1797: Sôjûrô plays the role of Sano Genzaemon in the Kiriza kaomise drama "Yuki Onna Keizu no Hachinoki". Sôjûrô, Segawa Kikunojô III and Ichikawa Yaozô III perform together in the Tomimoto-based dance "Miya Mairi Musubi no Kamigaki". 1st lunar month of 1798: premiere at the Kiriza (Edo) of Namiki Gohei I's play "Tomioka Koi no Yamabiraki", commonly called "Ninin Shinbê", in which Sôjûrô plays the role of Demura Shinbê [casting]. 9th lunar month of 1798: Sôjûrô plays in the same theater the role of Satsuma Gengobê in Namiki Gohei I's drama "Gozonji Godairiki" (very similar to "Godairiki Koi no Fûjime"); the roles of Sasano Sangobê and the courtesan Koman are played by Ôtani Tomoemon II and Segawa Kikunojô III. Fall 1798: Sôjûrô, the playwright Namiki Gohei I and Ôtani Tomoemon II go together to Ôsaka. 11th lunar month of 1798: fourth stay in Kamigata; Sôjûrô plays the role of Sano Genzaemon Tsuneyo in the kaomise drama "Kogane Bana Genji no Sakigake", which is produced by Yamashita Kamematsu at the Naka no Shibai; his stage partners are Nakamura Utaemon III, Arashi Hinasuke II, Yamashita Kinsaku II, Ôtani Tomoemon II, Onoe Koisaburô I and Fujikawa Tomokichi I. 1st lunar month of 1799: Sôjûrô plays in the same theater the roles of Hisayoshi and Motome in Namiki Gohê's play "Kinmon Gosan no Kiri". Hisayoshi's rival Ishikawa Goemon is played by Arashi Hinasuke II. 2nd lunar month of 1799: Sôjûrô plays in the same theater the role of Satsuma Gengobê in Namiki Gohei I's drama "Godairiki Koi no Fûjime". 6th lunar month of 1799: Sôjûrô plays the role of Tadanobu in the drama "Yoshitsune Senbon Zakura", which is performed in Kyôto at the Kitagawa no Shibai. 11th lunar month of 1799: Sôjûrô plays the role of Fujiya Izaemon in Chikamatsu Monzaemon's play "Awa no Naruto", which is staged in Ôsaka at the Naka no Shibai. His stage partner in the role of the courtesan Yûgiri is Yoshizawa Iroha I. 8th lunar month of 1800: Sôjûrô falls ill and decides to go back to Edo after recovery. 11th lunar month of 1800: Sôjûrô plays at the Ichimuraza the roles of Godai no Saburô and Ôtomo no Kuronushi in Nagawa Shimesuke I's kaomise drama "Oishigeru Nami no Une Une", which celebrates the shûmei of Ichikawa Danjûrô VII and Arashi Kanjûrô I. 1st lunar month of 1801: Sôjûrô falls seriously ill while performing at the Ichimuraza. 29th day of the 3rd lunar month of 1801: Sôjûrô dies in Edo. Outstanding tachiyaku actor, Sawamura Sôjûrô III was equally popular in Edo and in the Kamigata cities. He was an excellent wagotoshi and jitsugotoshi. Budôgoto roles were also his forte. His best roles: Gengobê ("Godairiki Koi no Fûjime"), Ôboshi Yuranosuke ("Kanadehon Chûshingura"), Ashikaga Yorikane ("Meiboku Sendai Hagi") and Soga Jûrô in numerous sogamono.